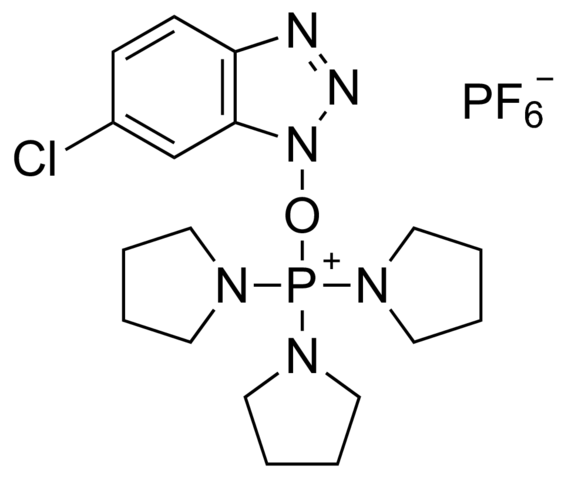 PyClocK®, a novel phoshphonium salts of benzotriazoles, which are highly reactive coupling agents, and are particularly useful in peptide synthesis. 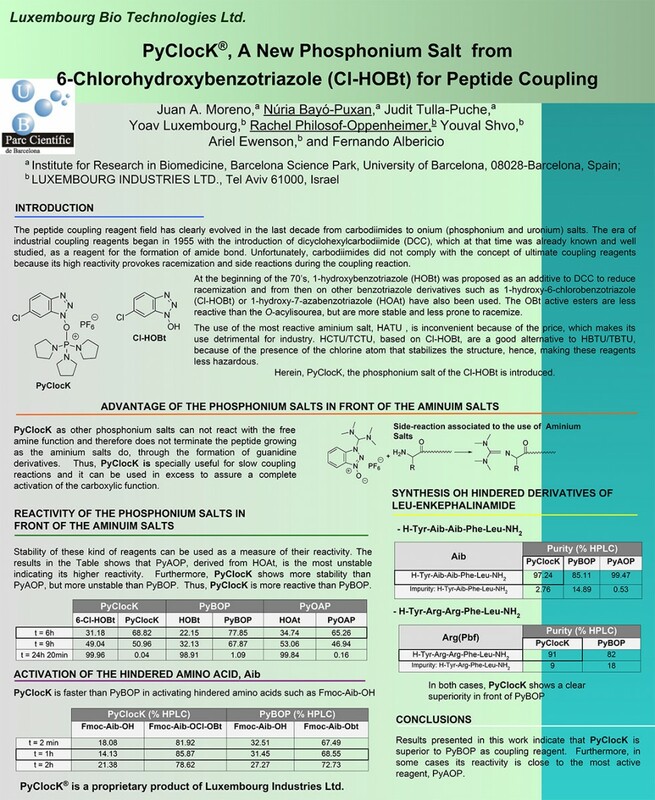 PyClocK®, is the 6-chloro analogue of PyBOP, is a proprietary product of LuxembourgBio Technologies Ltd. Reaction of protected amino acids with PyClocK in the presence of base generates the corresponding 6-chloro-1-benzotriazolyl (Cl-OBt) ester. These active esters are considerably more reactive than those produced when using PyBOP or HBTU, owing to 6-chloro-1-hydroxybenzotriazole (Cl-HOBt) being more acidic than HOBt. PyClocK® has been reported to be faster than PyBOP in activating hindered amino acids such as Fmoc-Aib-OH, and in some cases its reactivity was close to the most active reagent, PyAOP. PyClock®, as other phosphonium salts, cannot react with free amine function and therefore does not terminate the peptide growing as the aminium salts do, through the formation of guanidine derivatives. PyClock® is especially useful for slow coupling reactions and it can be used in excess to assure a complete activation of the carboxylic function. F. Albericio Chimica Oggi/CHEMISTRY TODAY, Vol 26 nr 4. C. A. Chantell, M. A. Onaiyekan and M. Menakuru J. Pept. Sci. 2012, 18, 88–91.